Today is the “official” first day of fall. Of course, I’m sad to say goodbye to summer 2015, but at the same time, I’m excited for fall. I love fall, I really do! What’s not to love about pumpkin spice, beautifully coloured leaves, and Thanksgiving feasts? Fall is also my favourite time of the year to experiment with style. The cooler temperatures are the perfect excuse to throw on a few extra layers, which means more interest and personality in every outfit. 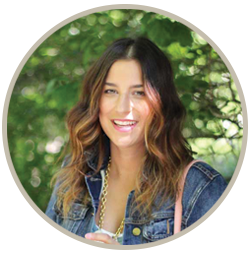 When Upper Canada Mall recently gave me the challenge of putting together my favourite fall look, it was a no-brainer that I had to rock a cardigan…but I needed a little bit more inspiration than that. I looked through the fall issue of Gorgeous Magazine and a few accessories with fringe detailing caught my attention. Lo and behold, when I was swooning over all of the fall goodies at Hudson’s Bay, I found THE perfect cardigan. Fringes, a hood, burgundy, and geometric patterns in one cardigan. As far as I’m concerned, it doesn’t get more perfect than that. What’s your must-have item this season? With that question in mind, you need to check out Upper Canada’s blog post for a chance to win a $500 shopping spree with their #FallintoGorgeous contest! If you’re not local, you should still check it out, because there’s some awesome style inspiration in that post…including a video by yours truly. A big ‘thank you’ to Upper Canada Mall for partnering with me on this post! This sweater is amazing! I love the bold pattern on it, and it really pops against the all black jeans and top. Awesome outfit. This look is all sorts of perfection! Obsessed with that cardigan and loveeee it with the all black! This is a great Fall look and that sweater/cardigan is amazing! I love the print and it looks so cozy! Cool cardigan! Definitely a no brainer when it comes to fall, especially with the fringe! Such a perfect fall look! Love the cardigan.. it is super cute! This outfit is adorable and has a chic-ness to it. I love how you have accessorized it – I especially adore that hate. Great ensemble. wahoo for fall time! love the layering and the black and white color combo! so chic! What a great sweater 🙂 You look great!! I love all the details. That cardigan looks so comfy and cozy, yet so chic. Head to toe perfection! P.S: Now I’m following you on Bloglovin too. Those jeans!!! LOVE how distressed they are. and they are perfection with your sweater! I am loving those jeans. This is the perfect fall outfit! Love your cardigan and how you paired it with all black. Super cozy and chic! I am so excited about fall. I cannot wait for the temps to drop a bit more. I love your outfit. The cardigan is amazing. Love this look Jackie! 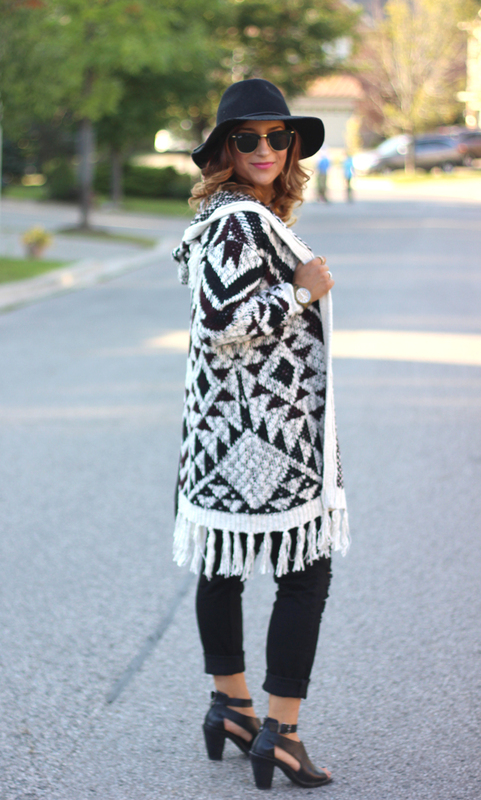 The distressed denim and fringe cardigan go so well together! I am more than ready for fall, especially the Thanksgiving part!! Such a perfect fall outfit. This cardigan is killer! As usual, you have the perfect Autumn outfit! That cardigan is magnificent and the details are perfect! 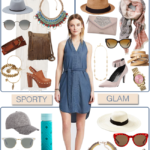 I also love the hat – it’s such a cute addition to this chic look! I get so excited for fall too! I love everything about it! Your cardigan is THE perfect fall cardigan! It has everything you could possibly want in a cardigan. Love it! So cute!! Love this look!! Love how you styled this and the chunky fringe sweater is amazing! Yay for fall fashion! We have to say that cardigan is so beautiful, such a fun and versatile statement piece! 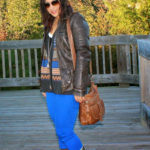 Your pics and outfit here are lovely! Thank you so much! I love the print and the fringes because both make a statement. Obsessed with this outfit and those shoes. You look amaze!